scdbg is an open source, multi-platform, shellcode analysis application that runs shellcode through a virtual machine that emulates a 32bit processor, memory, and basic Windows API environment. scdbg uses the libemu library to provide this environment. Builds of scdbg exist for both Windows and Unix users. Versions of scdbg are available for both *nix and Windows machines. The Windows version is the current development branch and includes many features not found in the older gcc builds. At the time of writing, this includes support for 246 opcodes, 15 Dlls, and 242 API hooks. You can view these stats along with exactly which API are supported by using the -hooks command line option. To see just the dll list use the -dllmap option. As scdbg runs shellcode, it will print out the API log of what the shellcode is attempting to do. By default, shellcode is not allowed to create files, or access the network. To try to keep the shellcode running smooth, many API are spoofed with fake return values. If the -i interactive mode is enabled, then shellcode will be allowed to access the network, and gain controlled ability to read/write files to disk. The file read/write ability is completely controlled by scdbg and influenced through several command line options to be discussed latter in the File System Access section. file format exploits which extract executables from parent files and drop them to disk. In scenarios such as this, you use the -f option to load the shellcode, and the -fopen option to give it access to the parent document. multistage shellcodes that load the second stage either via network sockets or from a parent exploit document. process injection shellcode. New threads (including remote) will be run in the same environment seamlessly for streamlined analysis. can detect and run jmp api+5 type hooks. The primary way to load shellcode into scdbg is with the -f option. This option takes a file path as an argument. For Linux users, this must be a binary file of the shellcode. For testing purposes, you can also load shellcode into memory using the patching functionality, or raw file loading capabilities along with the -nofile option. See the Patching section for more details. Perhaps the easiest way to run scdbg is to use gui_launcher.exe which is a graphical user interface that presents the user with visual options to launch the scdbg console application. The interface has checkboxes for most of the commonly used options, as well as the ability to graphically browse for the shellcode file, or launch several options from a right click menu. Shellcode files can also be loaded by dragging and dropping them into the upper textbox. If an option is not broken out to an individual checkbox, it is still available through the Manual args text box which will be appended to the built up command line. The last command line can also be copied to the clipboard for manual debugging. The gui application can also create a file association so that .sc files open automatically with it when they are double clicked. This is a very handy way to load shellcode files and gives them a slick icon to boot. Sometimes you dont know where the shellcode starts, usually because there is a ROP gadget on the front of the shellcode. In these cases the best place to start is with the -findsc mode. Findsc option will try to start execution at each offset in the file, and see how many steps it can execute without an error. If it makes it to an API address, then it will also abort and assume a successful run. If there is only possible start offset found (or if the -auto flag is used), it will go ahead and auto execute the shellcode from that point for a full report. If multiple possible start offsets are found, it will list them sorted by step count for you to select. For Windows users, a percent complete will be displayed to show progress. If execution reachs an API, it will be listed and moved to the top of the list. To select which start offset you would like to try, you enter the index listed not the actual offset (easier). If you just hit return, it will default to index 0. If there are to many possible start offsets, you can also increase the minimum logging threshold through the use of the -min option. 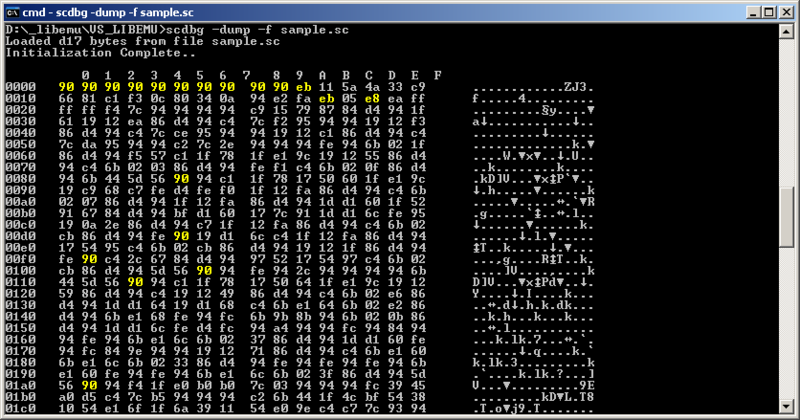 Another technique to locate the start offset, is to use -dump to display a hex dump of the file. Nops, Calls, and JMPs will be highlighted in yellow. You can then use -disasm and -foff to get disasm listing of parts of the file. or use -foff to start execution where ever you want. The older gcc builds also support the -getpc command which uses a different internal mechanism built into libemu itself. It is common for shellcode to decode itself in memory. In order to obtain a decoded copy of the shellcode after execution, you can use the -d dump option. If this mode is specified, it will scan memory after execution and compare it to the buffer that was initially loaded in. If changes are detected, it will dump memory to disk in the shellcodes parent directory. If any new memory allocations were created during runtime, they too will be dumped to disk and named by base offset. 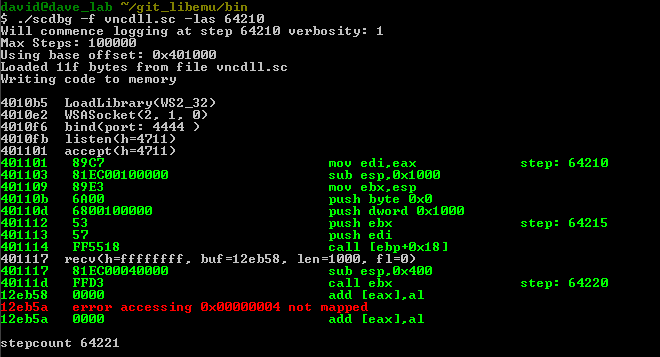 You can also create memory dumps and view hexdumps of memory at anytime during execution from the debug shell. Shellcode was last disassembly opened. Most shellcode is designed to be initial register value independant. In an effort to avoid emulation, some require specific values at startup. One variant in particular use a register already pointing to the start of the shellcode buffer in order to avoid having to use get_pc code which AV has strong detections for. You can set initial values of registers from the command line. using hex, decimal or keyword values. eg: -eax 0xdeadBeef or -ebx 12345 or -ecx base. Esp and EBP can not be set in this manner. The base keyword uses the shellcodes base offset. If you modify the shellcodes base offset with the -o switch, it must be specified in teh command line before the register switch is set. If you want to set all general registers to the same default value you can use -reg [value] switch. By default all general registers are set to 0. GetProcAddress does support ordinal lookups. The -api mode option will scan the main code body and any allocs just before termination looking for a continuous block of api pointers. If it can locate the API table, it will dump it	so you can see what api the shellcode loads and what the relative offsets are. This is useful if the shellcode is crashing somewhere after lookups are done but before it completes execution. Process injection and CreateThread shellcode is handled all at once seamlessly. File format exploits such as PDF, Word, Excel that extract executables or second stage shellcode from the parent exploit document can be easily analyzed by scdbg. These shellcode typically call GetFileSize with incrementing file handles trying to find an open handle to the parent document that the exploited application opened to load the document. In scdbg, this handle can be provided by using the -fopen [path] option along with -i for interactive hooks. This functionality is available in both the Linux and Windows builds. In the above example, the newly created file /tmp/WHhUmhtM will now contain a fully decoded exe that the emulated shellcode safely extracted from the parent document. By default, no file system access is allowed to the shellcode, and spoofed file handles and data are returned by the emulated API. Under limited circumstances, actual file system is allowed when specified by the command line switches. In -i interactive mode the shellcode is allowed to write files to disk, however scdbg controls the location and file names. For Linux versions, this will always be in the temp directory under random file names. For	newer Windows versions, they will be named sample_x.drop in the shellcodes home directory. The current	directory can be overridden with the -temp command line option. Similarly, memory dumps taken with the -d option will be saved to the shellcode parent directory. Shellcode can also access files you specify with the -fopen option. In these situations it will be provided	with a read only handle to the file you specify. This is used for file format shellcode which want to read in data from the parent file. The -cfo option (CreateFileOverride) can also provide access similar to -fopen. The -cfo option is used for shellcodes which do a download, then open the downloaded file to decode it. In these scenarios, you can use -cfo [path] to have scdbg direct the first CreateFile call to open the file you specify. Subsequent CreateFile calls (if -i is enabled) will be used to drop the decoded file to disk. its a bit of a hack but works and is useful. 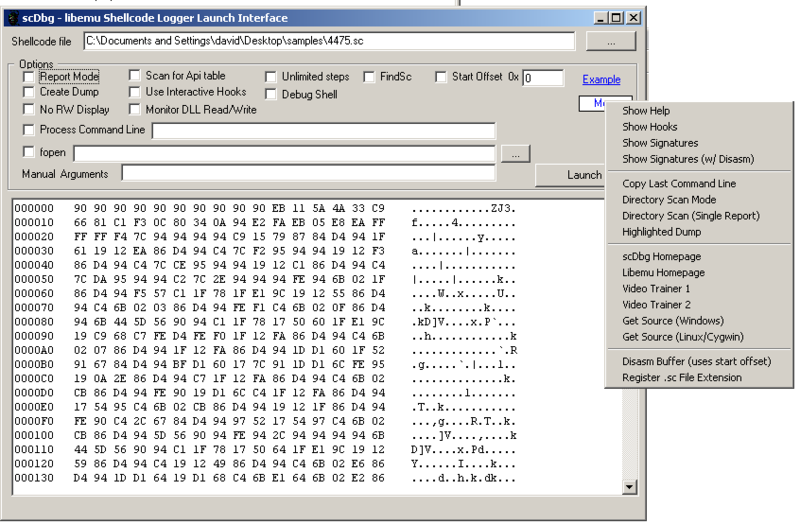 scdbg supports a memory monitor that will watch for access to DLL memory regions as well as to the PEB. it can automatically detect read/writes to these regions and report on it. This allows us to easily find API patching, and which module list is used from the PEB. Memory monitor -mm is enabled automatically for -r report mode, as well as a more verbose and immediate output available through the -mdll option as shown below. There are several times during testing, development, and analysis where the need for patching code into the emulated environment became necessary. There are now several mechanisms in place, all of which can be used to write test code to memory and can patch shellcode loaded with -f just before execution. Another way to load raw data into emu memory is with the -raw 0xBase-fpath. This command will load the file specified by fpath into memory directly as is at 0xBase address. The last two commands are -wint 0xBase-0xVal and -wstr 0xBase-Str . In some examples you may see them aliased as -spoke and -poke. -wint is short for write int, and is designed to write an integer value into memory at 0xBase. -wstr is short for write string, is can write a string into memory at 0xBase address. scmd files can also be launched by dragging and dropping them onto the scdbg icon. You can run scdbg across an entire directory of shellcode in a batch mode if you like. It will process all .sc files in the directory you specify with the -d [folder] command line. This mode will output one file per shellcode file it finds. You can also have all the results output to a single file with the (override) of the -r report option. If you want report mode on each file use the (override of) the -v option (now meaning Verbose in this case) Directory mode also supports the -u unlimited steps command, but be careful this could cause hangs. You can also run directory mode by dragging and dropping a folder onto the scdbg icon. You can set up to 10 breakpoints with -bp. The other options all use the same internal mechanism and can only be used one at a time. -bp breakpoints can be managed in the debug shell using the .bl (bp list), .bc (bp clear), and b (bp set) commands. You can also have it automatically enter the debug shell if it encounters an error during execution with -e 3	which means error mode set verbosity to 3. .idasync - connect IDASrvr plugin and sync view at step or break. Many modern shellcodes will include ROP gadgets at the beginning of the shellcode. These usually just setup memory for the main shellcode that follows it to run. Since the main shellcode does not start at the beginning of the payload,	you often have to locate the shellcode start offset. For help with this, see the Finding Shellcode Start Offset section	of the manual. 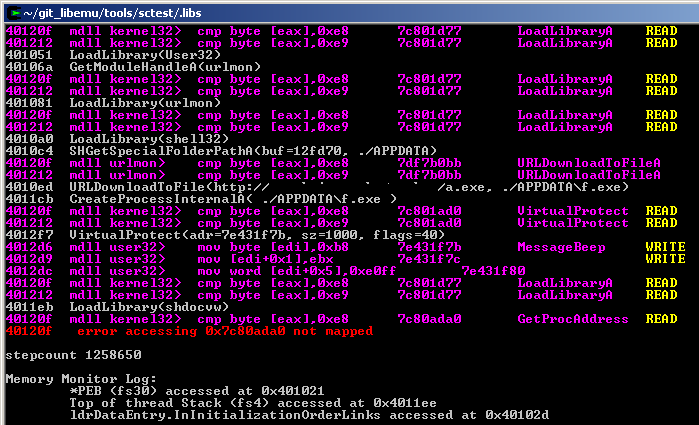 A ROP shellcode can be executed using the -rop flag. You may have to load other dlls into memory using -raw. It was an interesting experiment to add this mode, but probably not of much use. In practice, just use -findsc to find the real shellcode start offset and your fine. If its truly a ROP only shellcode, it will take more work to use scdbg to analyze it than necessary. scdbg supports a basic signature engine. This is used for -r report mode. You can view the built in signatures through the -sigs option. The -disasm option can be added to show the disassembly of each signature. A sample php script is available that will allow you to run scdbg as a web service. It is designed for the windows build, but could be modified to run the linux version as well. On windows, the easiest way to set it up is to use the WAMP server package. I would not recommend running it as a world accessible service. The script can be found in the github repository in the /support/webservice folder. A quick and dirty converter is available that can convert scdbg api logs into IDC scripts to add them as comments to the IDA disassembly. The comment will be added on the line after the call (the return address). This can be accessed by running gui_launcher and choosing API to IDC from the More menu. This document is not a complete listing of all command line options. Many can be figured out just from the brief help shown from the applications -h help screen. scdbg does not have version numbers, instead its compile date is shown on the help screen. When in the debug shell, type ? to see a complete listing of commands the debug shell supports. Libemu is a 32 bit only emulator. If you want to emulate 64 bit shellcode you will have to use another emulator such as Unicorn Engine. I do have a copy of scdbg that runs under Unicorn. This build is still 32 bit only at the moment but already includes all of the hooks, debug shell and some command line options from the standard version. If you wanted to pick up development and run with it, its a good starting point. It uses my libemu unicorn shim so I didnt have to rewrite it for the Unicorn API.